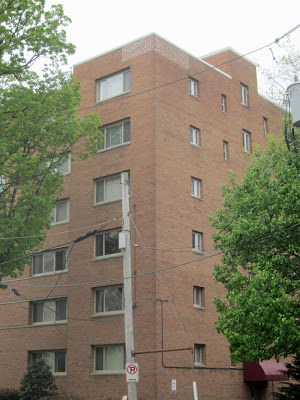 The top right corner of Rosslyn's Whispering Oaks apartment building (1310 N. Oak St.) has highly distinctive bricks. The Ode Street Tribune's investigative journalist speculates that these bricks are from a historic structure that used to stand on this site. From 1935 to 1942, just across the street at the present site of Prospect House was the General George S. Patton estate. At some point Hershel W. Williams, a Marine who won the Medal of Honor for his heroic actions at Iwo Jima, may have had one or more meals in a brick structure where the Whispering Oaks now stands. Preserving bricks from that building would help to commemorate Rosslyn's heroic history. Next time you're out for a stroll in Rosslyn, take a look at those bricks. And what better place or way to commemorate our heroes than with mismatched brickwork hidden in plain sight at the top of this noteworthy building. Great work OST. Better increase your investigative reporter's pay or he may be lured away by Fox News. It seems to me that the OST should stick with the fact. This story is mostly speculation. There are tons of possibilities -- for example, the mason who laid the bricks could have been an enemy agent and these brick could have been a secret signal to another secret agent. By counting the bricks in a particular manner one might be able to decipher a secret address when blueprints to a secret government project were stored for transfer to the second secret agent. By publishing this story, the OST might be opening itself up to retaliation by various secret agents. We love the OST and we do not want to see it done in some annoyed secret agent. The Ode Street Tribune has stood up to the massive multinational Cargill Corporation. The OST won't be intimidated by threats from "various secret agents." The point about counting the bricks is insightful. While dodging bricks, our astrological forecasting group will attempt to crack the code.